I would be hesitant to share, but hard pressed not to make a bad impression as a human representative, so I’d take it inside and make some tacos for what I hope is my alien friend. Since I don’t have a copy of that book (yet! ), I’d take my new friend to Maria’s Taco Xpress for a Verde Taco, followed by Bouldin Creek Cafe for a Tofu Neal taco, ending with a trip to Vegan Nom for a Vegan Jalisco taco. Man, now I’m hungry. I’d take that ET straight to Vegan Nom for the Rockin Vegan Migas taco! I wouldn’t want any harm to come to any special places that serve vegan tacos. I’d find the nearest meat taco stand and let him so there. I would congratulate him on an excellent request and bring him inside for some migas tacos! Oh my word. Completely sold. Long before you asked the question. Your photos are beautiful and I must get this book soon! Please don’t make me type my answer here. My filter is barely working as it is. I do it! Tacos are too good not to share! No discrimination here. An extraterrestrial lands in your backyard and says, “take me to your taco”, what do you do? …Pull down my pants? *zing*! I would definitely take them to Bouldin Creek for breakfast tacos! Or I’d serve him up my favorite lazy tacos. Because slang is lost on aliens. I would take the alien inside and attempt to make him tacos that will blow his mind and revolutionise life on his planet. I would take the extraterrestrial to Native Foods for tacos. They are really good! 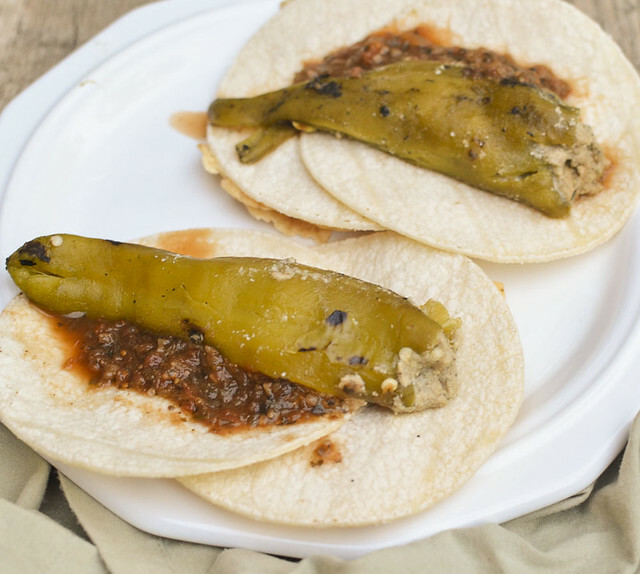 I would have my wife make some homemade flour tortillas, fresh pinto beans, and add grilled veggies from our yard. Thought the breakfast sauced and steamed tacos sound really interesting and like nothing I’ve ever tried before, so that might be fun to try with alien helpers. 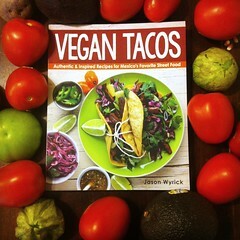 I’d whip out my copy of “Vegan Tacos” that I won through this wonderful blog and make them as many tacos as they wanted. Then they could take this taco information and spread it throughout the galaxy. Soon every planet would have taco stand (all vegan). There might even be a new planet called “Taco”, and maybe a few Gods named after the tasty treat. Of course you, Lazy Smurf, would go down in history for helping make it happen. sure don’t go to taco bell! 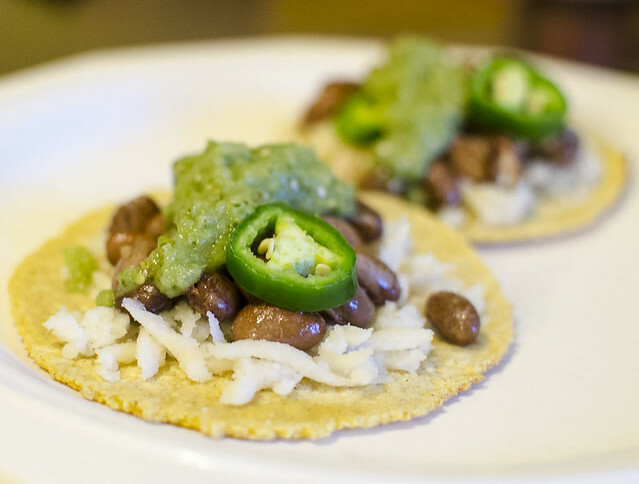 Break out South-of-the-Border Potato Tacos with Avocado Sauce from Vegan Junk Food! 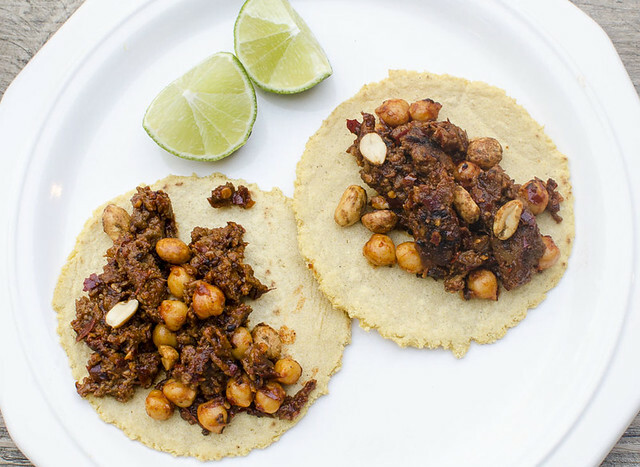 Crunchy Chickpea tacos coming right up! I show him the show The League and introduce him to the awesome character Taco! I would take the alien inside my house where the tacos were already prepared and waiting to be eaten, because that seems to be the norm around here lately. We dubbed this summer “taco summer” and ate many, many tacos. But since we need more variety, this book is an absolute necessity for me. I’d take a picture so I could prove that an ET was in my back yard! Well, I’d probably freak out at first. 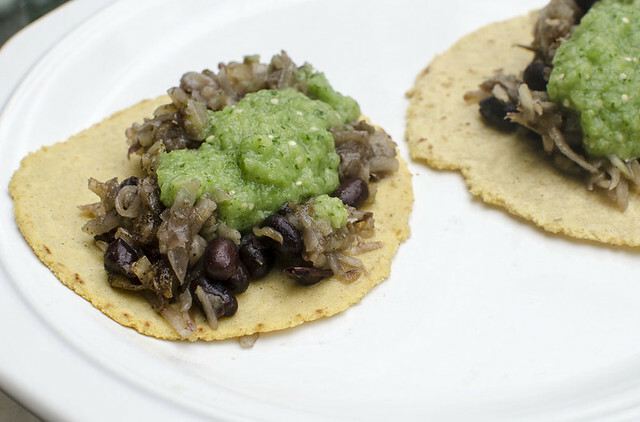 Then I suppose I’d make them a black bean and avocado taco. No US address but gah, these all look amazing! Ha ha! 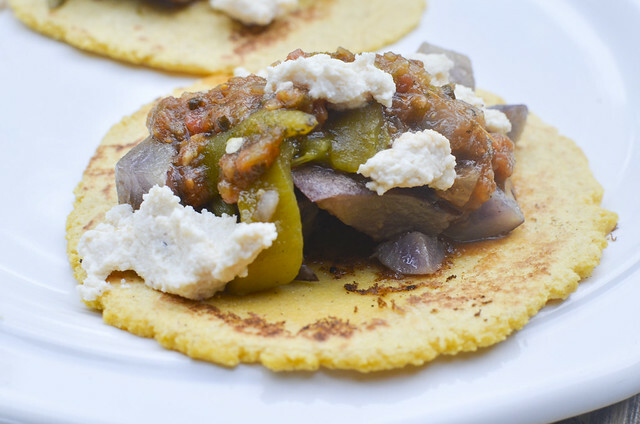 I would whip up a batch of vegan tacos and share! Well, I probably wouldn’t want to bring him (it?) into the house, because who knows how my cats would react? Interplanetary relations could be seriously threatened! Luckily, there is a Taco Bell (I know, I know!) down the street, and I know how to get some pretty tasty and cheap vegan tacos and burritos there, so I think that would be a plan; maybe not a good one, but very cat-friendly. I should have known plenty of these other filthy vegans had the same first thought that I did. 😉 So, I’ll just say, invite her in (why does it seem everyone assumes it’s a male?) and have a taco-makin’ party (while listening to The X-Files soundtrack CD). I’d say “Who the f*** invited you?”. I’m hoping that’d be enough for it to walk away and go to the next door neighbor’s fiesta. I don’t like to share, ESPECIALLY my tacos. I would give ET directions to Austin, TX, land of amazing vegan tacos. Would ask if they prefer corn or flour and make the best damn taco ever. No need to even leave the house! I would sent him to Chronic Tacos. I just found out from one of my kids that Chronic is a slang term for weed — ha ha. Wonder if ET would know about that? Ha! I can’t even imagine what the look on my face would be. I’d just keep asking questions to see what they wanted but in the end I’d take the alien to Veggie Grill for tacos. 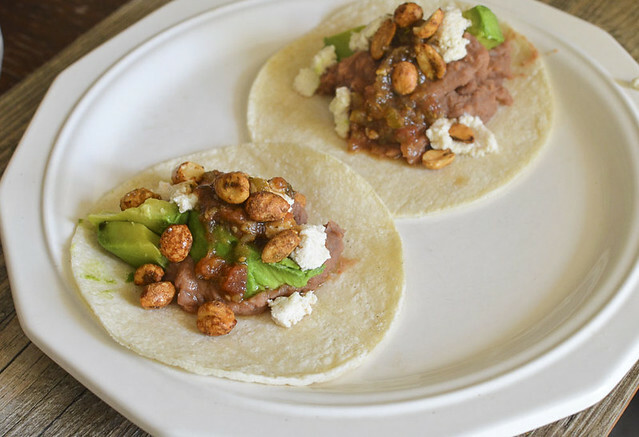 I’d make him some of OH She Glows Lentil-Walnut Tacos. I would hope that I had some tortillas in the house! Then I would make some sweet potato and black beans tacos. Yum! I either make them crispy tempeh tacos with pickled red onion and feta or take them to the local taco shop for the crazy creations they have there.